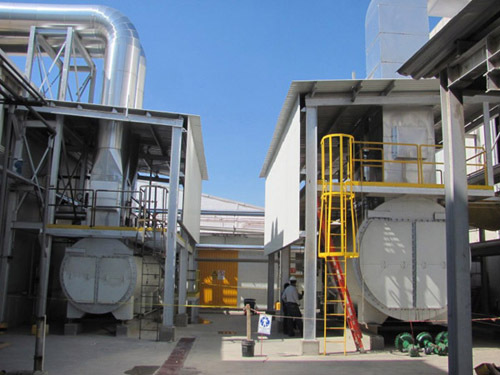 The challenge was to reduce the plant steam consumption by 25%. To achieve such a large reduction in steam use it was necessary to look at all the opportunities for replacing live steam with recovered waste heat. The Solution: There wasn't just one solution. It required a number of solutions. First all the existing steam traps were replaced with Fenix Hydrodynamic Traps. Then the flash steam from the condensate tanks was reused in the steam showers. A HRSG unit was installed on each of the larger machines and a Condex unit installed on the boilers. The key was to look at the project on a site wide basis rather than just individual applications. In particular it was impor-tant to find the lowest steam use pressure so as to maximize the energy recovery from the HRSG. It was necessary to match all the possible heat sources with heat sinks but also consider a design that had minimal or no impact on the production process. PES had installed the world's first high pressure HRSG for tissue machines at the KCM Orizaba plant which had gone well. PES also had a complete package of technologies and the necessary expertise to maximize their potential. We consider the Ecatepec project a great success. With all the various tech-nologies to be implemented it took several months to realize but the finished system provided the expected results. To reduce the overall steam consumption by around 25% is a major achievement and has a significant impact on the plant economics. The payback on the investment for the complete project was less than 3 years even taking into account the installations costs. Although it was possible to measure the performance of the individual equipment, the key issue was to see the net reduction in the boiler steam output which was over the 25% predicted. A very successful project which could be replicated in many similar installations.